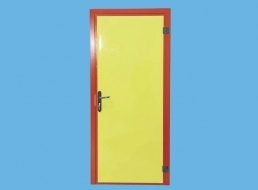 Service doors for technical cubicles, offices, sanitary facilities, or clean rooms. • Lacquered steel sheet 0.6 mm thick, colour white RAL 9010, polyester lacquer 25 microns thick (1). • 180° right or left hand opening (please stipulate at time of order). • Aluminium, in 2 parts*(4) (5). • Assembly by self-drilling screws supplied (7). panel thickness > 60 mm. • Panel thickness from 60 mm min to 130 mm max. • Lock with European cylinder. • Black polyamide hinges (9). • Easy cleaning stamped stainless steel lock striker. • For 2 leaves: top and bottom trigger lock on the semi-fixed leaf (10) and astragal between the two leaves (11). - Lacquered galvanised steel sheet 0.6 mm thick, colour: sand 42, polyester lacquer 25 μ thick. Green RAL 6018 - Red RAL 3000 - Blue RAL 5002 - Yellow RAL 1018. - 304 grade stainless steel, 0.6 mm thick. - Food grade polyester facing 2 mm thick. Standard RAL colours: White RAL 9010 - Red RAL 3000 - Blue RAL 5012 - Yellow RAL 1018 - Green RAL 6019. - DV methacrylate window 370 x 680 (width x height). - Flush fit SB type vision window 340 x 620 (width x height). - Electrically operated door opener. - JPM panic push bar. - High security cylinder for master key chart (European profile). - Base protection: aluminium sheet, rice grain finish, 1.6 mm thick, height 850 mm. - Base protection: 304 grade stainless steel sheet, 0.8 mm thick, height 850 mm. * Aluminium profile finish: polyester powder coating 60 to 80 μ thick, colour grey RAL 7001.
instructions identified by a serial number.